2x6 grids, single-level, covered, suitable for 2-5 guinea pigs. 30" x 90" assembled. Interior: 27" x 84.5" = about 16 Square Feet of cage space! Exterior: 30" x 90" when assembled = you will need a table space of about 2.5 feet by 7.5 feet to accommodate this cage. Our Flip-Fold Covers� are designed with you and your guinea pig's safety in mind. We compromise on neither and give you the best of both! With Flip-Fold Covers�, you only need one hand to open and close our covers, and you don't need something to lean them against to hold them up. Most people have their cages against a wall. 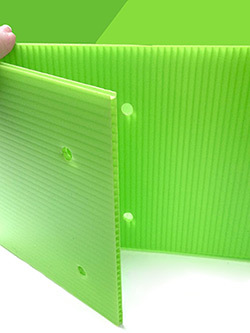 Our covers do not require you to rest the cover against your wall, leaving unsightly scratch marks. They rest nicely pushed midway out of the way or all the way back. Or you can just flip the front section over the back section. This refers to the HEIGHT of the COROPLAST on ONE long-side of the cage -- for the back wall. 6" (inches) is standard. 6" sides all the way around maximizes ventilation and visibility, and it is generally high enough to keep in bedding for most guinea pigs. Also, a water bottle spout resting on the top of the 6" Coroplast is a good height for guinea pigs to drink from. 12" (inches) is good if the long side of your cage is going up against a wall. This helps prevent hay (and in some cases bedding) from being kicked up and getting stuck against the wall. You can always cut it down later if you decide it doesn't work for you. The 12" option is just to help you keep your floor and wall cleaner in some circumstances. NOTE: We do NOT offer 12" walls all the way around because we do NOT recommend it. It cuts off too much air circulation for the guinea pigs. In addition, even if you wanted it regardless of our advice, coroplast is only 48 inches wide and that would require 51 inches. 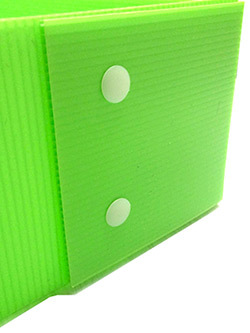 4mm Coroplast bottom in your choice of 15 colors! Cable ties in black or white, matching the grid color. Reinforces the connections, making the cage extra tight and super secure. The cage does not have grids on the bottom. They are unnecessary. The cage is designed to sit nicely on a flat surface -- a table top, a desk, the floor (if it's draft-free), etc. However, if you desire, you can make a cage stand out of grids. Please see our matching Jumbo Cage Stand if you are interested in a cage stand. We include detailed instructions with every kit, but if you have questions, we are always more than happy to help you out! Just contact us--pop us a note with your phone number and we will call you back as soon as possible with in-person assistance! Please do not put the Coroplast directly on a hardwood floor. Moisture from the air and/or wood can get trapped and has nowhere to go and hence can cause sweating -- which has NOTHING to do with the quality or character of the cage. Nor is the cage leaking. All you have to do is put something absorbent down first like a towel or carpet and set the cage bottom on that instead of directly on wood. How many Guinea Pigs will fit in a 2x6? Up to 4 adult guinea pigs comfortably. It varies a bit, depending upon your group. For example, rarely will 4 adult males be compatible even in this large of a cage. Usually 3 males is about the largest group that will get along together in any caged environment in the long run. It would be possible to house a larger, well-bonded group of 5, perhaps as many as 6, but that would really be pushing it. ONE guinea pig needs at least a 2x3 grid-sized cage. And this is why the JUMBO size is IDEAL if you need to divide a cage because a pair is fighting OR you need to separate a male and female to prevent pregnancy. You just need a Cage Divider or our "Wall of Silence" down the middle of a 2x6 to instantly create two 2x3 grid cages. If you want the biggest and the best cage and need the added safety of a top, then this is what you should get. Even just two guinea pigs like the additional space to run around. You get to add more hidey houses and interesting things in the cage when you have more space. Note: Coro bases with 10" walls for hedgehogs are NOT returnable. I KNOW this cage will fit in my space! You've READ the cage dimensions in the description below and you have MEASURED your space and you KNOW that this cage will fit there. Grids are bigger than feet. Our cages are large. Please order appropriately. Love this cage! I think it is totally worth the money and if I ever need another cage, I will not hesitate to get it here. I was a little bit concerned about how the top would look and if it would be sturdy enough. I have 2 twenty pound cats. The top is very strudy and I don't worry ay all that it will give way or anything else. I also purchased one of the kitchen add ons. It's fantastic. The rest of my cage stays SO clean. Just a few poops here and there! We purchased this cage for our 2 guinea pigs. It is hands down the best cage we've had. The lid took a little time to put together, but it was smooth sailing after that. Don't be afraid to use the zip ties. It seems flimsy until you use them. Our piggies seem happy, and so are we! The black grid with black bottom looks much nicer than our previous cage. *We purchased 3ft. (W) x 8ft. (L) plywood from Home Depot for less than $18. (They carry 4ft. x 8ft. in stock, and will cut down to 3ft. width at no extra charge.) We placed the plywood on top of our 6 ft. folding table and it was a perfect fit!! This cage is absolutely perfect for Sable and Nilla, my two girls who don't get along very well. I got this with the "Wall of silence" and it's great! They have a LOT of room to run around and popcorn and be happy. But, as for the flip-fold cover, I couldn't get them quite even, and they don't sit very well. I've taken them apart, and put them together again more times than I could honestly count and they're just always crooked and uneven. Also, I was a little unhappy with the fact that the coro didn't already come with double stick adhesive tape already on it, like the piggy kitchens did. I mean, the cage itself is expensive. I just thought the tape would have been included. Got 1 guinea pig in July, got 2 more in October, they are all girls, Millie the first one is just over 6 months and the Twinea Pigs, Lillie and Gwenie, are just over 3 months, they are all sisters, same mom same dad. We bought the 2' x 6' pen with a lid and I love it. My pigs have room they have houses and toys and 2 big metal feeding bowls. I am so happy with the ease of setup and the ease in cleaning of the cage that I bought. Thank you for the great info that this site provides. I have owned pet rats before and have found that the noises that rats make does not compare to the chirps, squeals, squeaks, and whoot whoots that my pigs express. Love Guinea Pigs.